Hester Collyer leads a privileged life in 1950s London as the beautiful wife of high court judge Sir William Collyer. To the shock of those around her, she walks out on her marriage to move in with young ex-RAF pilot, Freddie Page, with whom she has fallen passionately in love. Adapted from Terrance Rattigan's 1952 play, The Deep Blue Sea was written for the screen and directed by celebrated British director Terrance Davies (Distant Voices, Still Lives, The Long Day Closes, The House of Mirth). Academy Award winner Rachel Weisz (The Constant Gardener) and Tom Hiddleston (War Horse) both put in remarkable performances as the leads in a film also starring British theatre actor Simon Russell Beale (My Week with Marilyn). 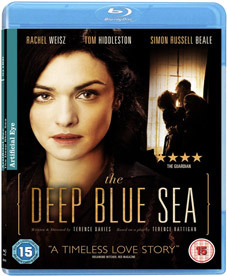 Winning critical acclaim for its theatrical release in 2010, The Deep Blue Sea comes to UK DVD and Blu-ray on 2nd April 2012 from Artificial Eye at the RRP of £19.99 for the DVD and £19.99 for the Blu-ray. Being Artifical Eye and a Terence Davies film we would expect at least one extra feature, but none have been so far detailed.